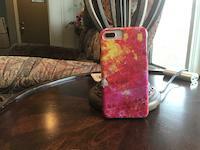 Red Anemone iphone x case by Ruth Hulbert. Protect your iPhone X with an impact-resistant, slim-profile, hard-shell case. The image is printed directly onto the case and wrapped around the edges for a beautiful presentation. Simply snap the case onto your iPhone X for instant protection and direct access to all of the phone's features! This is one of my favorite paintings, inspired by some of the strange and gorgeous organisms I've found hanging under rocks at low water. 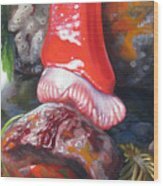 These particular anemones and snailfish are painted from ones I saw at the south end of San Juan Island. 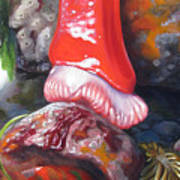 Ruth Hulbert is an Alaskan artist presently based out of Bellingham, Washington. Her website is woodfrogart.com.